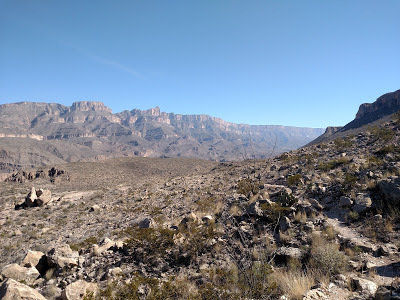 I think I'll try to make a habit of this; coming to Big Bend National Park in February and escaping the north country winter blues. I was here last year under similar circumstances and had such a wonderful time that I returned on almost the same exact dates. 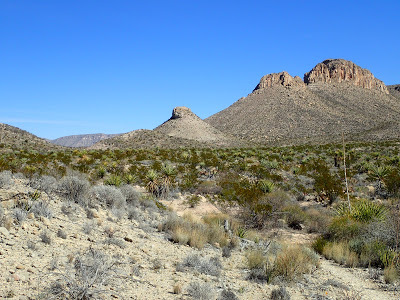 Big Bend is a well-known though not very well visited park who's remoteness is the greatest asset. It is anywhere from a 4-7 hour drive from the nearest major airports or cities and there's not a lot of civilization nearby. Even in February, when the weather is a balmy 80 degrees most days, I hardly ever run into other hikers or paddlers. To me, its a dream. 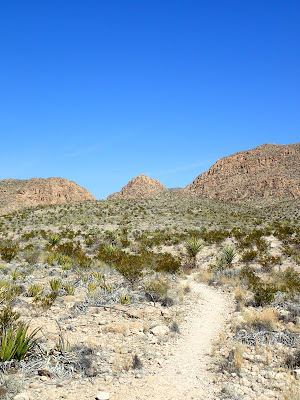 The trail starts right off of a gravel turnout on the road to the Boquillas Canyon Overlook and hiking trail near Rio Grand Village. It is not very well marked though easy to spot if you are looking for it. 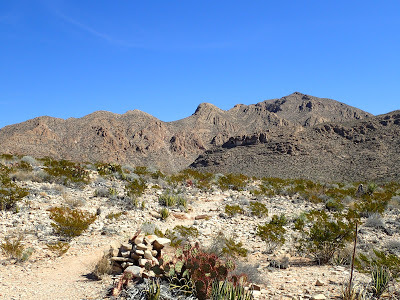 It remains mostly flat as it winds its way up an arroyo marked with cairns. There are remains of an old aerial tramway from the mining era that has been long abandoned. The trail reaches a fork at about a mile and the Marufo Trail goes off to the right. The obvious tower in the distance is Schotts Tower on the Mexican side of the Rio Grande. At about 7,000ft of elevation, it rises about a vertical mile above the river in less than two miles. 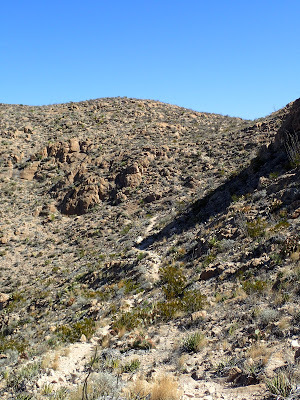 The trail heads in a mostly northern direction through a pleasantly undulating section with panoramic views. Desert life appears slightly more lush at the higher elevations. I hardly took more than a few steps without feeling compelled to snap a few photos. Without any cell phone reception and no signs of civilization, the solitude is very real. I love trips like these. I encountered two other well marked turnoff for the Strawhouse Trail though kept on the Marufo Vega trail by bearing right (Northeast) at both junctions. 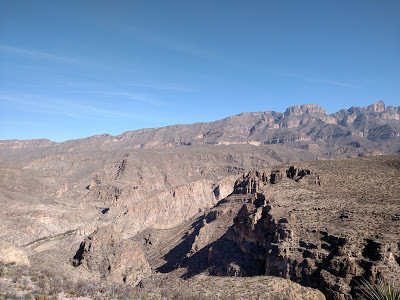 From a topographic map, the changes in elevation aren't that obvious but when I was hiking, I found there were an abundance of narrow canyons and gorgeous vistas that made the trail very diverse and delightful. 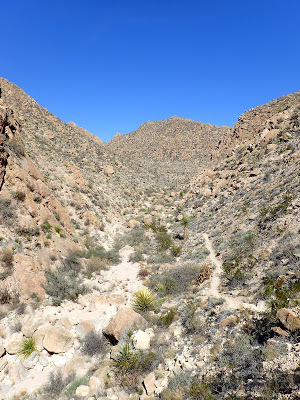 Without a doubt, the most remarkable section of the trail is the loop it makes around the tall vista above the Rio Grand. This begins at the final fork in the trail and one can hike in either direction. 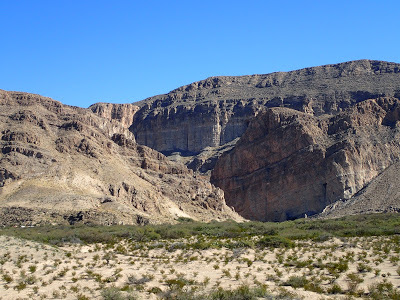 The river creates such a sharp contrast in the surrounding arid mountains. It seems to slide through the ridgelines with ease. When I paddled the Rio Grand, I noticed the verdant banks with abundant evidence of desert fauna which dependent upon the river. From elevation, the divergent environments of the mountains and the river was even more apparent. 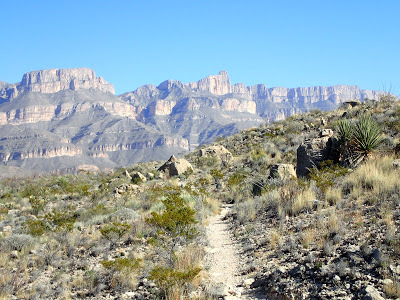 Rounding the lower rim of the Rio Grand, the trail continues with its glorious views until meeting the fork. From here, it is a fairly straightforward return the way it came. Afternoon shadows and sunlight made the views even more ethereal. At about 14 miles total, it is certainly an all day affair to hike this trail. Again, there are no services on the entire trail and absolutely no cell phone reception. I recommend carrying at least a 3 liters, if not a gallon of water for the day and plenty of supplies in case the worst should happen. Definitely let somebody know of your expected return time and who to contact if you miss it. 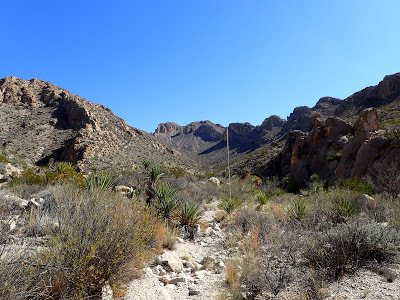 Though it is an arduous hike in some ways, the reward is perfect solitude and desert views. 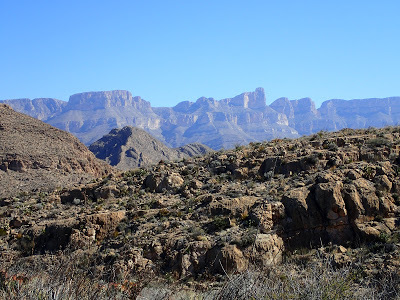 I highly recommend this one if you're in the Big Bend area.